Chill your favorite adult beverage to the perfect temperature without diluting. Spirits Cooler set (XB2446) includes a hand-blown glass, corks, and stone. 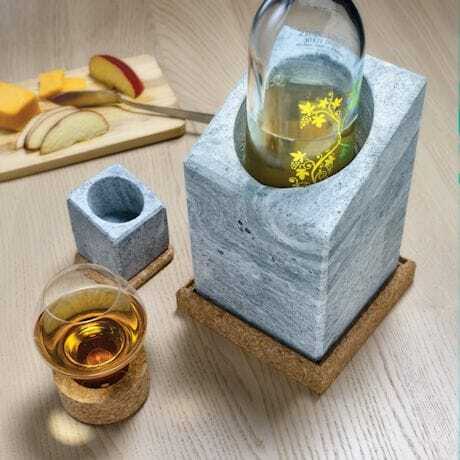 Set the glass in the cork ring, fill to the top of the ring, then place in the stone. In a few minutes, fine spirits are gently and perfectly cooled. Wine Cooler (XB2456) chills a bottle of wine or bubbly without the bother of a bucket. Keep stones in the freezer and they're always at the ready. Made in Sweden. Sold separately.